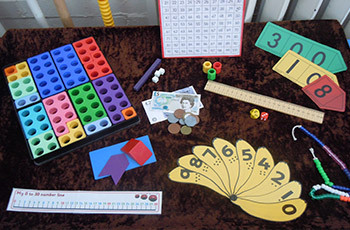 The school follows the National Curriculum for number, measurement, geometry and in Year two statistics, using Numicon and Longman resource programmes. Children are taught to use the four rules of addition, subtraction, multiplication and division, as appropriate and to learn from practical mathematical activities e.g. measurement, weight, capacity, time, money. We teach children to use and apply their mathematical knowledge and to build confidence and develop their problem-solving, fluency and investigation skills. Extra opportunities are created to encourage children to use their mathematical skills e.g. book shop, selling ice cream to the children, collecting and counting tokens and shape walks. The PTA have recently purchased us a support IT programme for mathematics and each child has a unique log in which can be accessed at home and at school. Using inverse Multiplication and Division – practically drawing to solve the problem e.g. arrays. Fractions – ¼ ½ amounts and measuring Geometry Properties of shape. Measurement and statistics – e.g. symmetry pictographs interpreting graphs Christmas Maths – Problem solving / revision. Exploring mental strategies & drawing problems. Addressing areas children found difficult Part, whole number bonds to 100. Known using bonds. Problem solving.